Winds of over 2km per second have been discovered flowing around planet outside of the Earth's solar system, new research has found. The University of Warwick discovery is the first time that a weather system on a planet outside of Earth's solar system has been directly measured and mapped. The wind speed recorded is 20x greater than the fastest ever known on earth, where it would be seven times the speed of sound. "This is the first ever weather map from outside of our solar system. Whilst we have previously known of wind on exoplanets, we have never before been able to directly measure and map a weather system." "HD 189733b's velocity was measured using high resolution spectroscopy of the Sodium absorption featured in its atmosphere. As parts of HD 189733b's atmosphere move towards or away from the Earth the Doppler effect changes the wavelength of this feature, which allows the velocity to be measured". "The surface of the star is brighter at the centre than it is at the edge, so as the planet moves in front of the star the relative amount of light blocked by different parts of the atmosphere changes. For the first time we've used this information to measure the velocities on opposite sides of the planet independently, which gives us our velocity map." The planet is shown at three positions as it crosses its parent star. The changing background illumination allows us to separate absorption from different parts of the planetary atmosphere. By measuring the Doppler shift of the absorption we are able to measure wind velocities. The blue-shaded region of the atmosphere is moving toward the Earth at 12,000 mph, while the red-shaded region is moving away from the earth at 5,000 mph. After correcting for the expected spin of the planet we measure a wind velocity of 5400 mph on the blue side, indicating a strong eastward wind flow from the heated day side to the night side of the planet. 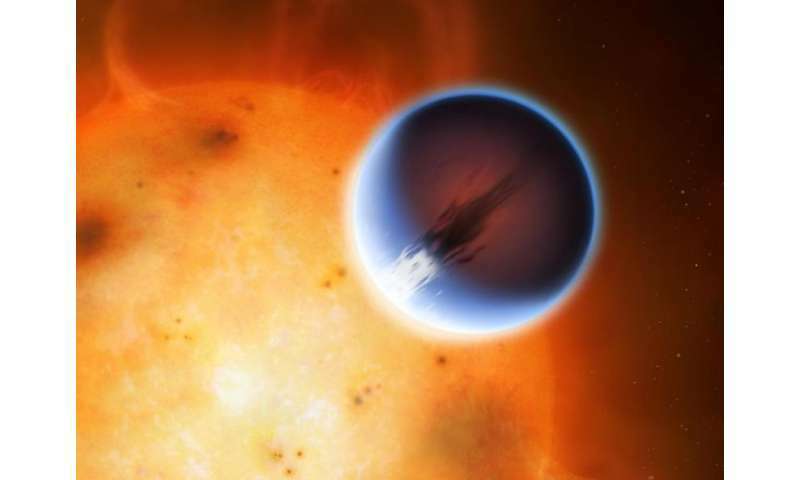 "We are tremendously excited to have found a way to map weather systems on distant planets. As we develop the technique further we will be able to study wind flows in increasing detail and make weather maps of smaller planets. Ultimately this technique will allow us to image the weather systems on Earth-like planets. " HD 189733b is one of the most studied of a class of planets known as 'Hot Jupiters'. At over 10% larger than Jupiter, but 180x closer to its star, HD 189733b has a temperature of 1800'C. Its size and relatively closeness to our solar system make it a popular target for astronomers. Past research has shown that the day side of the planet would appear a bright shade of blue to the human eye, probably due to clouds of silicate particles high in its atmosphere. The research, Spatially resolved eastward winds and rotation of HD 189733b, is published by The Astronomical Journal Letters. We will need an Exoplanet Weather Service. Wind chill factor:-278359 ..."Brrr...It's Cold....Bundle Up"
I wonder what wind that moves faster than the speed of sound sounds like rushing past. Whatever shredding eardrums sounds like! you do know that the article was not written by the authors of the study, right? and an article is NOT the same as a study, right? are you completely illiterate, being intentionally stupid or did you just completely refuse to read anything? Well, even this site lives on advertising, most of which targets American readers. Therefore, unfortunately, many of the articles show measures in US Customary Units, even if the original text has them in sane and usable units. Fortunately, most of us in the ("tiny" ??) Rest of The World can convert units like miles, pounds and PSI to sane units in their head. Browsing FAA crash reports tells us that people losing their lives simply because of hiccups caused by the funny and idiosyncratic American systems of measure, are no rare exception. If the Russians were as arrogant as the Americans, there'd be no end to tort about the Americans missing Mars several times in a row simply because someone or other got miles and kilometers mixed up. 63 ly away, even with daily forecasts it would be useless when (or if) I got there! A whole planet ripe for 80's feathered haircuts. i bet the planet isn't that old, probably formed in last 10 mill yrs. question is, does it have a solid surface or core ? probably Not.. winds that high are expected, If any of our gas planets were 180x's closer to our sun, their winds would go Much faster as well.